I don’t know what I love more about this look, the skirt or the shoes! I picked this skirt up from the Dao Chloe Dao boutique in Houston a few weeks ago. I liked this skirt when I first saw it, but I honestly have not had much luck with leather or faux leather skirts. I really didn’t think I was going to like it once I put it on, but I couldn’t just walk by it. I immediately fell even more in love as soon as I put it on!! Standing in the fitting room, I imagined this skirt with tight turtlenecks and booties or heels and sweaters with tall black boots. Leather is one of those materials where either it fits or it doesn’t. It doesn’t really have any stretch. This is the first leather skirt I have tried on that fit me perfect. We really were meant for each other! Since it is from a boutique, I don’t have a link to it unless you want to call the boutique and see if they have anymore left. I did however find a similar one and linked above as well as a cute suede version. My other favorite item of this look is these shoes!! I bought these with a birthday gift card. I kept going back and forth on if I should buy them, and I am so happy I decided too! I bought them from Nordstrom, and they have the most amazing no guilt return system. It made me more confident in at least ordering these shoes. As soon as I opened the box, I knew I made the right choice. First off, they are the pantone color of the year, marsala, wine, maroon, burgundy, whatever you want to call this color. I love it and how perfectly it works with the camel color of my skirt. I also love the strap details on these shoes. One of my concerns was how these shoes would look on my petite frame. Occasionally when a shoe has a straight strap across the ankle it can make me look shorter. I think the slim version of the rest of the shoe helps to alleviate that short look from the top strap. From the front these shoes remind me of ballet shoes with the strap placement. I’m just so in love with these shoes, I could probably plan an outfit around them everyday. This also means they will be repeat offenders on the blog all fall and winter!! 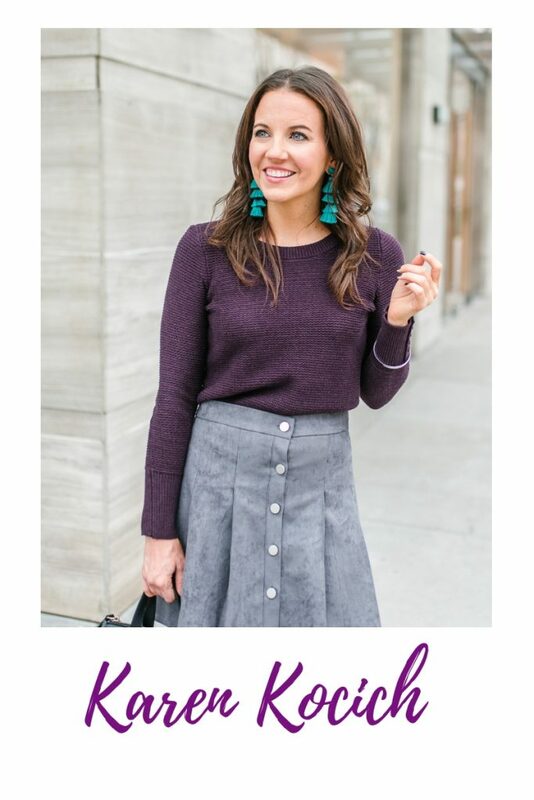 I have tried these on with my skinny jeans and they look equally amazing as they do with this skirt! I will have to share a look next week! Stay tuned!! Also, I have to wish a HUGE Happy Birthday today to my first ever blog subscriber, my Aunt Jen!!! Now I will see if she really reads my new post emails 😉 Thanks for stopping by the blog today! This outfit is so amazing. 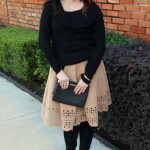 I love the camel skirt and burgundy flats! I adore both the skirt and those stunning shoes! I love that camel skirt but your shoes is my fave in this look!! If you like sharing your photos online, you can earn from them. Get $25 signup bonus too. More details on my blog! Oh! This skirt! Perfection – and gorgeous with those divine shoes. Loving this look. That camel skirt it divine on you! I absolutely love it, and those berry/wine heels are such a pleasant pop of color. Gorgeous, girl! I always love camel and black together! And the pop of color with the shoes is great! Obsessing over this look! You look so amazing that skirt is so darling! Everything about this outfit is total Fall perfection! The skirt, the shoes (Oh the shoes! ), the top, the necklace! I love it all! LOVE this! Such a cute skirt and oh SO amazing shoes!! You look beautiful and Happy Birthday to Aunt Jen!! 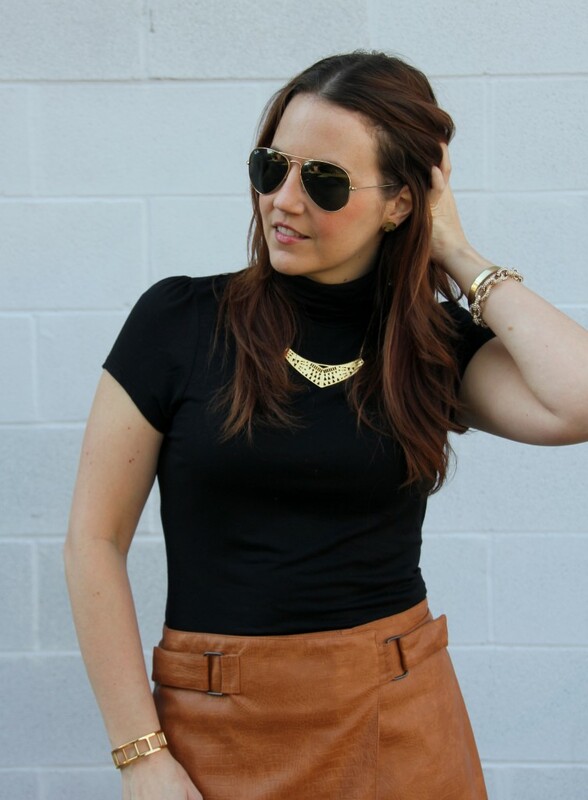 Great minds think alike 🙂 I love mini leather skirts and I LOVE your camel leather mini paired with the short sleeves turtle neck. Very cool! I so agree with you about the skirt and the shoes! My first reaction – that skirt is amazing!!! Then I scrolled a bit and spotted those gorgeous shoes and I was definitely smitten. Will be looking for those today! Great look! I just ordered a skirt like this and love those shoes with it! I love that the leather skirt isnt black. It makes it so unique. The faux turtle neck top is very cute! fantastic outfit, I adore this skirt and the shoes are amazing.